As a dad, I try to find experiential ways to create memories with my kids. I want to create lasting memories, and for me, I remember a lot of my childhood memories with my parents being around food. We lived in Connecticut, so I remember playing with the lobster before we ate them. And Orange Julius was a treat with my Mom, while vegetables from my Dad’s garden, that I helped weed, were a connection with my Dad. So last year when I read about Pumpkin Spice milkshakes from a local, fancy pants gas station, Wawa’s, I knew my oldest boy, born the day before Halloween, would connect with it. So we made the trek, and typed in our order on the touch screen, and walked over to watch the lady make it. And then the worst thing possible happened, the ice cream machine broke. No milkshakes. Next time we made the anticipated trek, it was too late and the coveted Pumpkin Spice milkshake was discontinued for the year. You can imagine my 7 year old’s disappointment. But this year, the Pumpkin Spice milkshake returned and we visited and no machine malfunction happened. And as expected, the Pumpkin Spice milkshake was awesome! So, since we tasted greatness, what else to do then to mimic it. Below is my attempt to recreate, perhaps outshine, the greatest milkshake I’ve ever tasted. 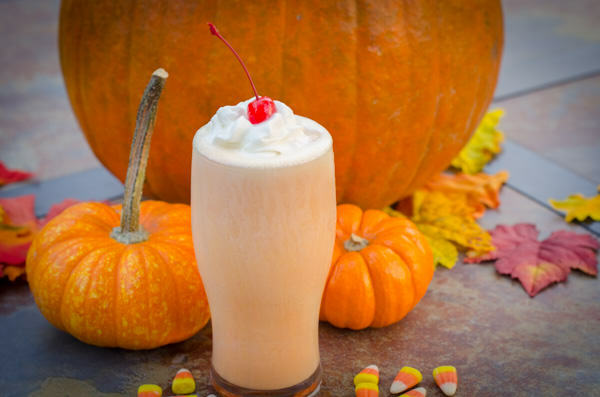 The Pumpkin Spice Milkshake. Enjoy! By the way, you might ask, what does a Pumpkin Spice milkshake have to do with a grilling website? I would respond with a question: what goes better with a burger and fries than a milkshake??? 2Preheat oven to 425° F.
3Whisk eggs and milk and pumpkin pie spice and mix with the Libby’s Easy Pumpkin Pie Mix. 4Put a pan large enough to hold a pie pan into the preheated oven. Pour hot water into the pan to 1/2 inch deep. 5Put glass pie pan (with no crust) into water filled pan (water bath). Fill pie pan with pie filling mix. 7Reduce heat to 350° F. Cook for 45 minutes. Check for doneness by inserting a knife into the center of the pie. Pie is done when knife comes our clean. With the water bath, this make take longer than a normal pie would take to cook. 8Let pie filling cool. Once completely cool, cover (or transfer to tupperware) and put into the freezer until frozen. 9Add ice cream, milk and 1/4 of frozen pie mix to a blender. Blend on high until smooth and mixed. Add more milk or ice cream until you get a thick, but creamy texture. 10Pour into cups and top with whipped cream. 11Add cherry, or sprinkles or just a straw.